The term "illumination" is used to describe the art of decorating manuscripts through the application of gold or silver. Literally to "light up" or "enlightenment", the tradition of illuminating manuscripts exists across many cultures and religions and extends to both sacred and non sacred texts. The Turkish term for illumination is "Tezhip" which means "to gild" and is derived from the Arabic word "dhahab" meaning gold. © 2016 Wajeea Mirza. This is a reproduction of an illuminated surah heading from "The Anonymous Baghdad Qur'an" - a Mamluk Qur'an which dates back to the 14th century. The Arabic calligraphy in the central star reads "Surah al-Nisa - 176 ayas". Materials: 2 different shades of 22 carat shell gold, 12 carat (white) shell gold and hand ground pigments on tea stained watercolour paper. 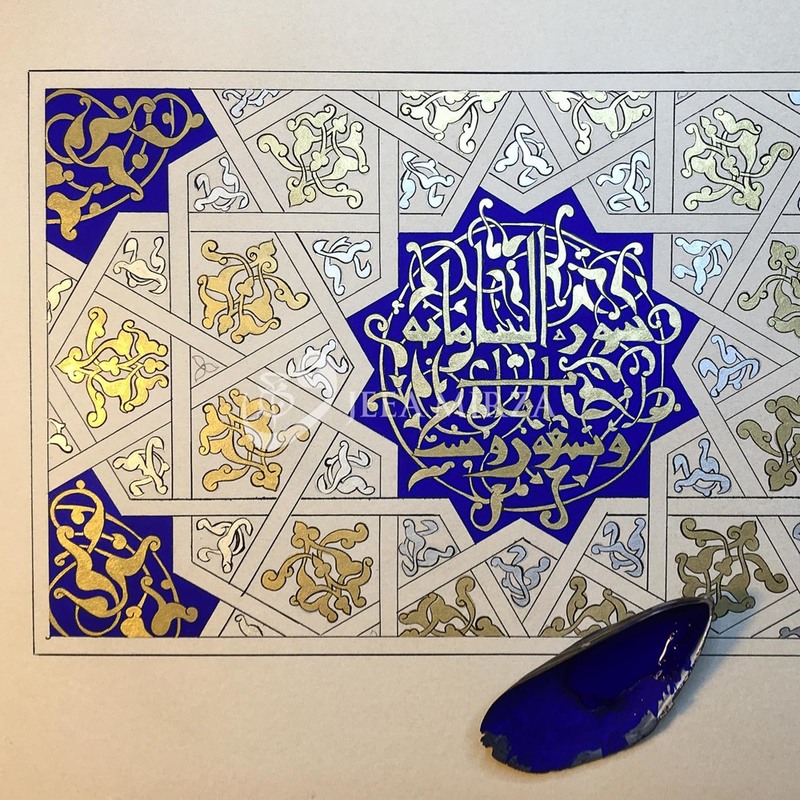 I studied the illumination techniques to create this painting with Ayesha Gamiet at The Prince's School of Traditional Arts. Please see the resources section of the site for more information and links. © 2016 Wajeea Mirza. The tools needed for raised gilding on gesso. Once the gesso has fully dried and hardened, the letter is gently burnished (polished). This smooths the surface of the letter and makes it ready to receive the gold which will shine more brightly when the surface is as smooth as possible. 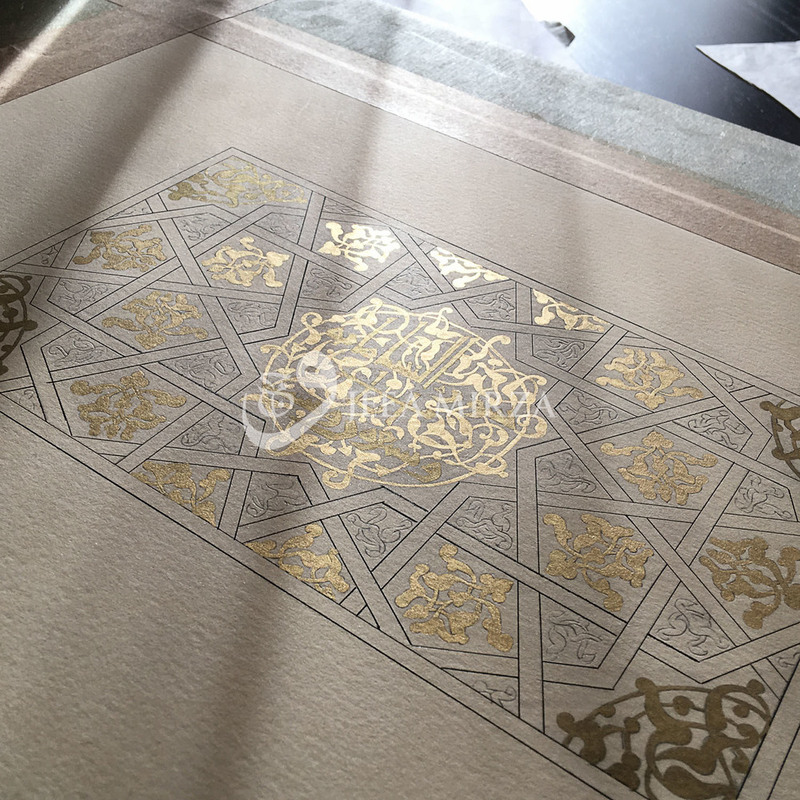 Loose leaves of gold are then cut and carefully applied until several layers have been laid and the letter is completely covered. The final step is to gently burnish the gold until a beautiful mirror like shine is achieved. I studied these techniques with Helen White at the Prince's School of Traditional Arts - and would highly recommend a class with Helen to anyone interested in working with gold - see the resources section of the site for more information. Copyright © 2016 - 2019 Wajeea Mirza. All rights reserved. Through this website you are able to link to other websites which are not under the author's control. We have no control over the nature, content and availability of those sites. The inclusion of any links does not necessarily imply a recommendation or endorse the views expressed within them.